Electric lawn mower, manually pushed. The power input - 1000W, working width - 32cm, collecting box - 35 l, the weight - 8,9kg. 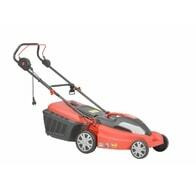 Rotary electric lawn mower with plastic chassis and engine input 1200 W. Width of cut 33 cm. Recommended cutting area 400 m2. The cutting height is set centrally. Height of cut 20-60 mm. Electric rotary lawn mower with plastic chassis. Power input 1400W. Width of cut 34 cm. Suitable for areas up to 600 m2. Centraly set height of cut 25-65 mm. Electric powered rotary lawn mower with plastic chassis. Power input 1600 W and working width 38 cm. Suitable for areas of up to 700 m2. Central adjustment of cutting height. Turbo motor with high torque. 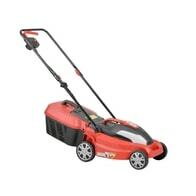 Electric lawn mower, manually pushed with the central cutting high adjustment. 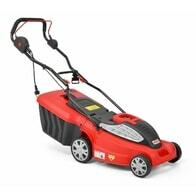 Power input - 1800W, Working width – 42 cm, grass collector – 50 L, weight - 19 kg. Electric lawn mower without self propelled system. Metal chassis, cutting height adjustment, working width – 40 cm, power input – 1600W. Electric powered rotary lawn mower with steel chassis. Power input 1600 W and working width 41 cm. Suitable for areas of up to 800 m2. Central adjustment of cutting height. Mulching kit included. TURBO motor. 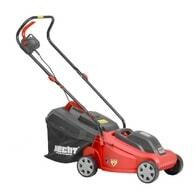 HECHT 1845 is electric lawn mower, equipped with a “turbo engine“ with power input of 1800W. 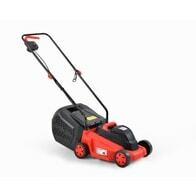 Working width – 46cm, edge cutting, grass collector – 60 L, weight – 23,8 kg. Electric lawn mower, self propelled. Mulching kit, side discharge, 60 l grass collector. TURBO engine with power input of 1800W. Working width – 46cm, weight – 26,4 kg. Electric powered rotary lawn mower with steel chassis, equipped with ball bearings. Power input 1800W and working width 46 cm. Mulching kit included. Suitable for areas of up to 1000 m2. Electric powered rotary lawn mower with steel chassis, equipped with ball bearings. Power input 1800 W and working width 46 cm. Suitable for areas of up to 1000 m2.